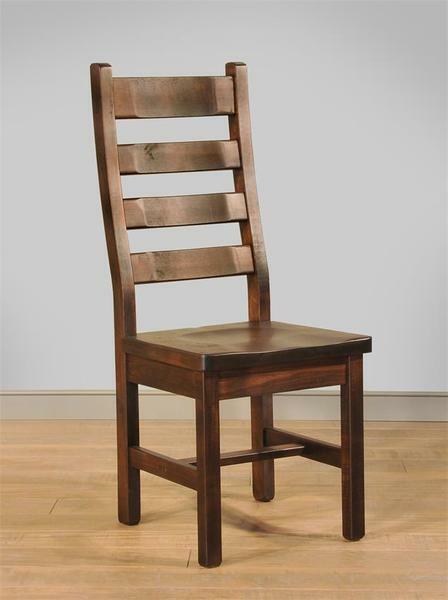 The Amish Algonquin Side Dining Chair invites you to cozy up, sit down and stay awhile. These exquisite dining chairs display a rich ladderback design with rough sawn lumber that looks warm and inviting. The very essence of country charm, your Algonquin dining chairs complement farmhouse style furniture or your country style furniture collection easily. Line the dining room table or supply your kitchenette with a set of these customizable chairs. The ladderback style chair is a classic and provides proper support as you sit and dine, converse or enjoy coffee with a loved one. The thick slats of the Algonquin have the slightest curve to them, creating the look of a beloved, cozy chair that has been broken in just right. Made of wormy maple wood, these Amish made dining chairs are finished in the stain of your choice with specialty glaze finishes available. These dining chairs come to you from a woodshop in Ohio and are custom built using old woodworking techniques. What is "rough sawn" lumber? Rough sawn lumber displays the wood as close to the original cut as it can. This includes surface imperfections, such as pin holes and saw marks that create a unique texture. Rough sawn lumber is perfect for supporting a combination of rustic and modern style furniture that is very popular. Learn more about this style in our popular blog post, "Country Glam." Be sure to review our line of Amish Dining Room Tables to find the one you like best. Please call one of our Amish Furniture Specialists today at 1-866-272-6773 with any questions. We would love to hear from you!